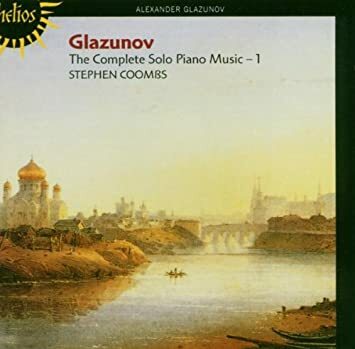 Coombs divides the solo piano music of Glazunov into 4 volumes, each one featuring at least one long work. Thus, the Theme and Variations op. 72, the 2 piano sonatas, and the Prelude and Fugues op. 101 are all on separate discs. Coombs made sure to add works without opus number as well, including a few student works of bizarre maturity. In this way, Coombs gives each work its due, and thus making the volumes have a kind of big-picture progression in and of itself. So today was my first day of playing a viol. It's a treble, and it's fairly difficult to play, though not really in ways I would expect. Impressionist. That's probably the best descriptive term for him. Prokofiev did so many things in his music that simply don't make sense if one were to look at each piece of the puzzle. One has to see the complete picture to try to understand the ideas he's trying to communicate. In this way, harmony often overrides melody because an idea doesn't always need a melody. Yet Prokofiev has a clever way of combining melody with unusual harmony sometimes. This was fun to write. There is so much that can be analyzed by Prokofiev, so I will organize it into several sections. I will add onto it over time, perhaps. All times are GMT +1. The current date and time is Apr-25-2019 03:04.